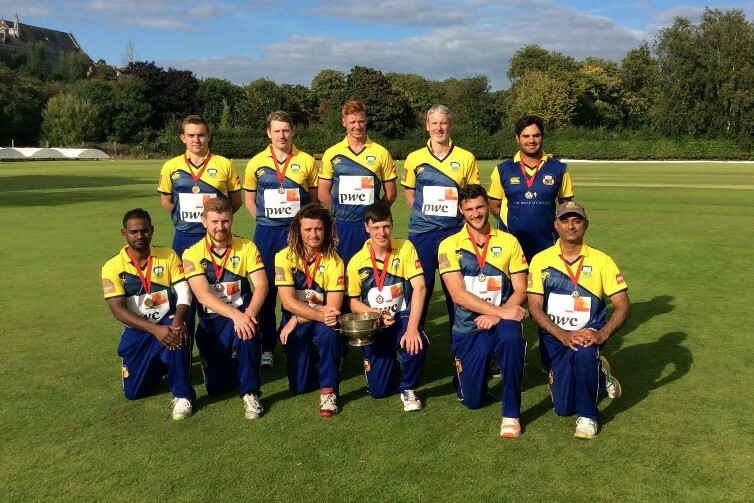 Cork County won the Senior Cup at the Mardyke on Saturday by a convincing margin of 163 runs against Limerick. It was County's 12th Senior Cup title since the turn of the century which included victories over County Galway and Midleton to progress to the Final. Limerick having won the toss elected to bowl on a beautifully prepared pitch which received high praise from the umpires at the previous night's Inter-pro Trophy game. It soon became apparent that the pitch was proving a bit more difficult to read as the County openers struggled to get the ball away. By the time Gary King joined Stephan Grobler midway through the 13th over County had lost the wickets of Aaron Cawley, Cormac Hassett and Robert Duggan and were 3-34. Progress continued to be slow with only three boundaries being scored in the next 11 overs. The pair kept the scoreboard ticking over with impressive running of singles which kept the Limerick fielders struggling to contain. By the 39th over, when on 59, Grobler edged and was caught behind, the partnership of 155 had proven a game changer. King continued to find boundaries with more regularity and reached 151 in the penultimate over before he was bowled by Ibrahim Khan next ball. A wonderful innings which was appreciated even by the Limerick players who had been at the receiving end of it. A target of 287 was a big ask for a Limerick side unused to playing on a tricky wicket which required patience. The Limerick innings opened in dramatic fashion with a flurry of extras and with the score on 33 Limerick had only scored 5 runs off the bat before Limerick Captain, Ziz Khan, was bowled by Aaron Cawley. In sharp contrast to the bizarre opening, the next 18 overs saw only 34 runs being scored for the loss of a further 4 wickets with the dismissals of Khalil Ahmad, Farrukh Bhagat, Murtaza Sidiqi and Khalid Ahmad. Farman Yousafzai offered token resistance scoring 15 off 41 balls but by the time Mustafa Sidiqi scored 31 off 25, before being caught in the deep by Grobler, the game had already slipped away from the Shannonsiders. The presentation ceremony was conducted by MCU President, Michael Hickey, who presented medals to both teams and the Senior Cup to Cormac Hassett. Gary King was deservedly awarded Man of the match for his match winning 151. Cork County 286-7 (King 151, Grobler 59, O'Reilly 28*, Khan 3-23) beat Limerick 123 all out (Sidiqi 31, Carey 2-17, O'Sullivan 2-20, Cawley 2-26) by 163 runs at the Mardyke.